Before I was a nerdy 28-year-old playing video games on Xbox, I was a nerdy 12-year-old playing computer games on a Macintosh that was the size of a dishwasher. My own personal version of Silent Hill was Dark Seed. To this day, after barely being able to hold my controller through Doom, Bioshock, Condemned, F.E.A.R, Dead Space and Resident Evil, Dark Seed remains the scariest game I’ve ever played. You start as a man with a persistent headache who, after a lot of frustrating clicking and pointing, ends up traveling through a mirror into a parallel universe that is nothing but nightmares and evil alien beings. It ends with you peeing yourself. Giger directly designed art for the Dark Seed series of psychological horror point-and-click adventures. 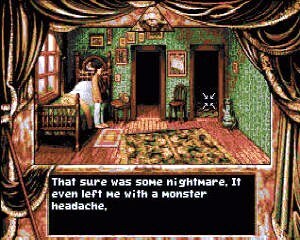 Arriving on PC and Amiga in 1992, the original title is set in a mansion somehow connected to a parallel universe rendered in typical Giger-esque style: hive-like environments, psychosexual horror and visual references to the Kleinian Archaic Mother concept. The two titles received mixed reviews at the time, though they are notable in their use of high-resolution visuals (which the artist insisted on) and the bizarre appearance of the lead designer in the lead protagonist role. Without Giger’s biomechanical paintings we also wouldn’t the Alien franchise (he worked with Ridley Scott on the visual effects team for the first movie, which was inspired by his piece, Necronom IV). Head over to Abandonware for a free Windows download of this underrated masterpiece.